The arrival of the Coconut Phytoplasma disease of coconuts has placed the International Coconut Gene bank (ICG-SP) at a very high risk of being infested by the phytoplasma with devastating consequences of losing all its important genetic diversity. As a significant bio security risk every possible bio-security measure are taken to ensure the disease does not spread to the new areas and the ICG-SP. Apart from the containment the accessions must be saved from the possible BCS attack. The Kokonas Indastri Koporesen has started to collect coconut ascensions from all the original sites as recommended by the BCS committee. It has been 26 years since the last collections and most of the palms remaining are at least 50 years old. Currently the status of most of these palms are either nonexistent or are senile. The collection from the ascensions will be done on the condition that the regrowth is from the same population. Replants that have been introduced from elsewhere will not be collected. Pollination and Collection from ICG-SP (ex-situ). The provinces known and suspected of BCS presence include: Western Province; East Sepik; and Madang. These accessions will be collected last to ensure we keep them away from others in the event that BCS is unknowing present on the materials during the nursery tests. The absence of accessions in the original location (in-situ). This will require the production of seeds with control pollination as recommended by the BCS committee. The time period for pollination to maturity will be 11-12 months depending on the varieties. ­ The microorganisms that causes the BCS disease cannot move by itself to another host plant. Extensive Research have proved that the mode of BCS spreads by means of insect vectors involving in plant to plant transmission or humans moving infected host plants. The choice of Misima Island to house the Pre-Entry Quarantine Nursery was critical considering the possible dangers of the BCS spread. As Misima island, is separated by sea it creates an excellent natural barrier for any possible pest and disease out breaks moreover containing the possible spread. 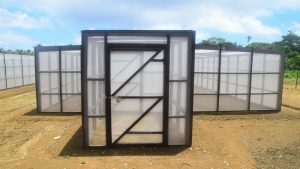 There is a total of three Pre-Entry Quarantine Nursery’s with an aphid screen enclosure. From the Nursery building, fifty meters radius has been cleared solely for keeping the insect vector and host plants away from the PEQN. At any one time the PEQN can germinate up to 1,700 seeds, with 300 seeds in each seedbed arranged in 10 rows with 30 seeds per row. Presently 1 out of 3 nursery’s contains all the Southern Region Coconut Accessions. These accessions are now being germinated on the seedbeds in an aphid screen enclosure. The arrangement will keep each accession separate in each seedbed to avoid mixing of accessions. In addition, the seedbeds are separated by access roads which is clearly labelled according to the Name of accession, date of collection and the date sown in the nursery. To comply with phytosanitary requirements all seed nuts will be treated before shipment out of the provinces by NAQIA and the collections team. The BCS test will take at least a month. 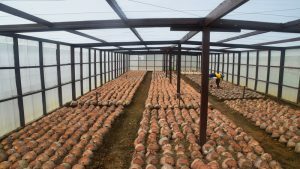 Once the accessions are cleared of BCS presence the seedlings will be uprooted, packed and shipped to Punipuni plantation. At Punipuni the seedlings will be raised in the poly- bags nursery for 6-12 months before field planting in a replicated trial. Momase Region – Morobe Province, Madang Province, East Sepik and Sandaun Province.